A recent football tournament brought 70 children from eight schools together as a fundraiser to raise money to put defibrillators in schools. One lucky school, Ballymacrickett Primary School, won a samaritan PAD defibrillator on the day that was donated by Belfast-based HeartSine Technologies. With a goal of having defibrillators in all Northern Ireland schools by 2015, Defibs4kids chairman, Art Kernan, revealed that Ballymacrickett are now the 172nd School in Northern Ireland to have a defibrillator. The tournament was supported by the Red Cross, who have teamed up with local company Sopra Group (UK) to provide free staff defibrillator training to all the schools that participated. Lisburn PSNI and Lynda Donaldson from the British Heart Foundation also have pledged to support parents from the participating schools by providing first aid training. The tournament was hosted by St Colman’s Primary School, which launched the Defibs4kids campaign in June 2013. 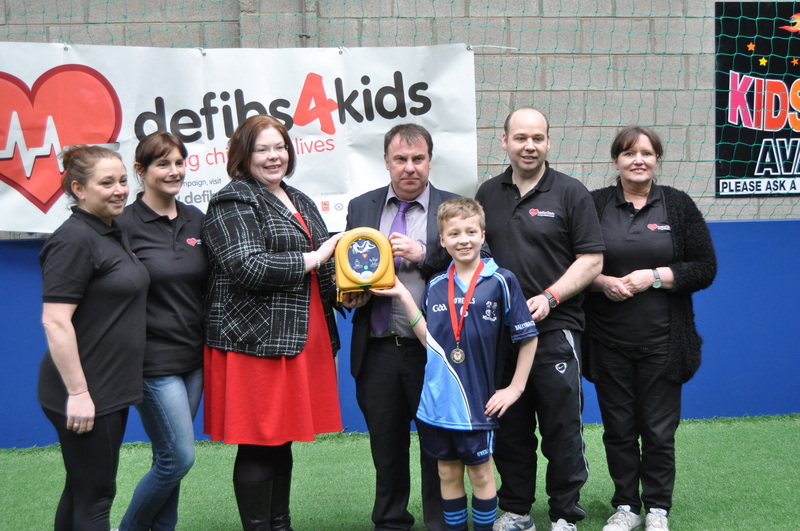 The Defib4kids campaign was founded by teacher Mr Art Kernan and a parent, Mrs McConville, in order to improve cardiac arrest survival rates which currently kills 270 people every day in the UK, no matter their age nor level of fitness. By administering CPR in the first five minutes after a sudden cardiac arrest survival rates are 5%, when a defibrillator is used survival rates soar to up to 70%. As well as St Colman’s and Ballymaccrickett, other primary schools participating in the tournament were Dunmurry, Ballymacward, Good Shepherd, Pond Park, Meadow Bridge and Maghaberry. The tournament also was supported by Sport NI, Department of Culture Arts and Leisure, Lisburn City Council, Hillsborough Boys Club and the Lisburn Invitational League. “Defibs4kids are keen to see defibrillators in all schools by 2015. “We are delighted that more than 170 schools now have defibrillators on campus.. Through our innovative defibrillator mapping group (set up in conjunction with the ELB, NIAS and Sopra UK) we now know that the Belfast and South Eastern Education and Library Boards are leading the way with each having 44 schools with defibrillators. We would encourage any schools or parent’s associations who want more help or advice to contact us through our website, www.defibs4kids.com, or our Facebook page ‘defibs4kids’. “The campaign was inspired by a child in my very own school, Eoghan McConville, who has had open heart surgery and is now actively playing sport. “Sudden cardiac arrest is not something that happens to older, overweight, unfit people. This can happen to anyone at any time, including children. It was great to see so many children from so many schools participating and getting involved in the Defibs4kids campaign. The children showed a great knowledge of heart issues and we want to continue to raise awareness throughout our communities. The Minister of Education, the Minister of Health and the Minister of Arts Culture and Leisure all endorse our campaign and we look forward to the continued support as we want to see AEDs in ALL schools. “We believe around 1 in 50 children suffer a heart arrhythmia and many don’t know it. These children are the most susceptible to sudden cardiac arrest. “Some countries already have legislation in which public buildings, including schools, must have defibs on site and ready to use. “If survival rates increase to just over 70% when a defib is used, then the statistics speak for themselves. Lynda explained that having a defibrillator in conjunction with the knowledge of CPR skills is something we want each child, parent, staff and the wider community to have. The tournament was supported by, IFA, DCAL, Lisburn City Council, Lisburn PSNI, Sopra UK, Hillsborough Boys FC, Children’s Heartbeat Trust, Red Cross, British Heart Foundation, HeartSine Technologies, and Next Level Fitness. Special thanks must also go to coaches Mark Patton (Glenavon FC), Damian McConville, William Conville, Jonathan Michael (IFA), Lukazs Giblewski (IFA) Sam Sheppard, Kevin Hughes and Colleen McQuade Photography who helped to make the tournament such a success. 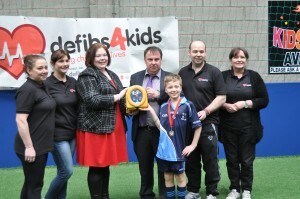 For more information on the campaign, visit web site www.defibs4kids.com or the ‘Defibs4kids’ Facebook page.